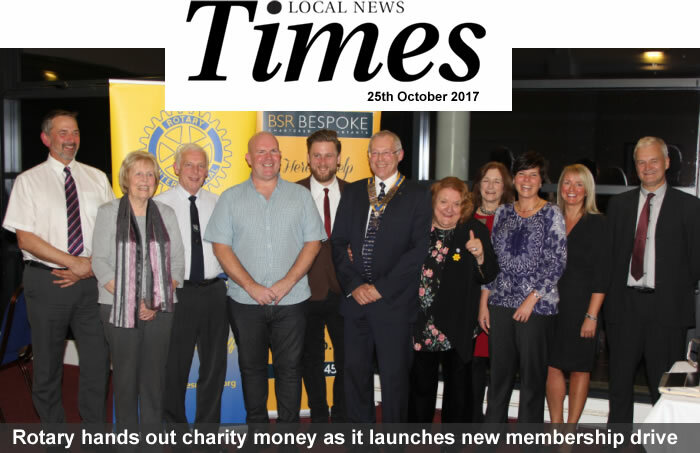 Rotary Club of the Pantiles News. President Roy Patey welcomes IPP Larry Domingo from The Rotary Club of Adliya in The Kingdom of Bahrain to their meeting last night with the traditional handing over of their Club Banner. The Rotary Club of the Pantiles, Tunbridge Wells had an historic day Thursday 11th October with the induction of six new members & a seventh hoping to join very soon. The sudden influx of new members is due in part to four past Royal Tunbridge Wells Round Tablers, Richard Benoy, Robert Hickmott, Dale Mockford & Steve Kirkham who enjoyed Round Table for many years, they are joined by Tim Davey, previously of Littlehampton Round Table & Stephen Wass. 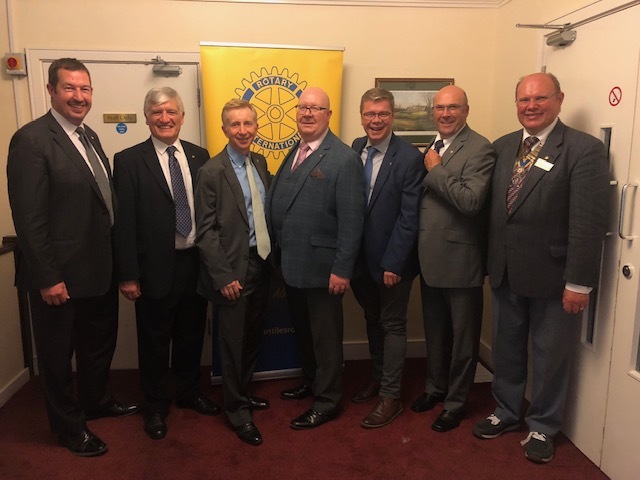 It is quite common to progress from Round Table to Rotary as you get older, as both clubs are very similar in their generous giving of time & raising thousands of pounds for their local community. Pantiles Rotary can certainly thank their club member John Teasdale who encouraged the Round Tablers to move to Rotary. Richard Benoy said, it was a great phone call the day I called John Teasdale & said “ John, we are ready to join your club if you will still have us”. The two clubs, Pantiles Rotary & RTWRT have had strong ties for many years, some of the original Rotarians started the towns famous Round Table Dunorlan Park Fireworks Display, which is celebrating its 61st year on Saturday November 3rd. Fourteen Rotarians will again be in the park to assist with this hugely successful event. Pantiles Rotary have their own very successful charity golf day at The Nevill Golf Club which this year raised over eight thousand pounds. If you enjoy socialising with like minded people & enjoy raising money that is given back to deserving groups & individuals locally, to improve their life or their club, then you should look up either clubs website. Royal Tunbridge Wells Round Table, age 18 – 45 or The Rotary Club of the Pantiles, Tunbridge Wells, age 40 & onward. Both Royal Tunbridge Wells Round Table & Pantiles Rotary have always been most grateful for the support we have received from the general public at our events & we hope this will continue at the Round Table fireworks display in Dunorlan Park on Saturday, November 3rd. David Fawcett a member of The Rotary Club of The Pantiles took time out whilst touring New Zealand and Australia to visit the Napier Rotary Club. Here he is handing our pendant to their president Renske Speekenbrink. At the start of 2018 Mike Hutchins handed over the responsibility of President of the club to Roy Patey having been in the role for 18 months. During his time Mike saw the club continue with many acts of fundraising for local, national and international charities. Membership of the club remained stable and contacts with other local clubs increased. Roy is now to be President for the next 18 months and plans to continue the good works Mike started as well as increase membership with further activities and greater business contacts. The ongoing contact with their twinned club in Wiesbaden will see a visit from their members to us later this year. The role of Vice President was taken on by David Buckley who has previously been Secretary of the club. The new Secretary is Oliver Williams. 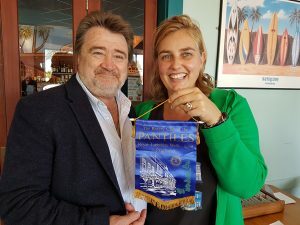 A MEMBERSHIP drive and new website have been launched by The Rotary Club of The Pantiles in a bid to attract new people. The plans were unveiled at their annual Giveaway Dinner this month. The organisation raises thousands of pounds a year for local charities. Vice-President Roy Patey said: “We are hoping the website will help us to recruit more members, particularly enthusiastic younger people. “Sadly, there has been a decline in membership over recent years, and we’re encouraging people to join because it is an opportunity to do something practical for our community rather than just putting £5 into an envelope. “It’s also a chance to meet like-minded people in a very sociable environment.” He added: “Sustainability is always a challenge. We currently have 24 members whereas we used to have around 70, and we are one of just two rotary clubs now after the third one was forced to close. The group is based at the Nevill Golf Club in Benhall Mill Road and meets several times a month. The biggest of their charity events is their Golf Day in July. 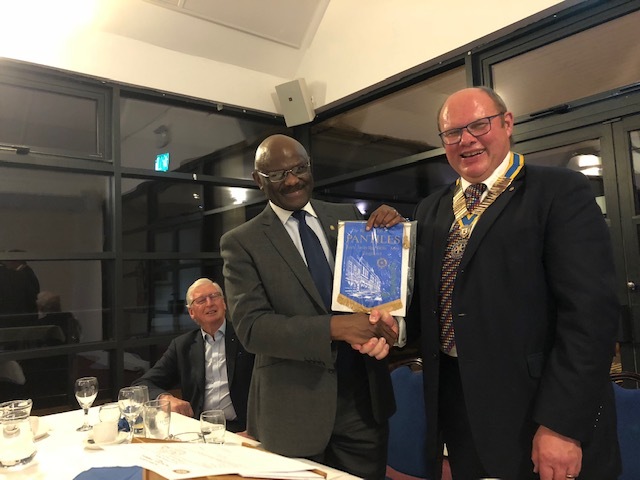 During the Giveaway Dinner, President Mike Hutchins presented a share of the £6,800 raised for charity to Tunbridge Wells Hospital Radio, Pickering Cancer Drop-in Centre, Porchlight and the Tunbridge Wells Counselling Centre. Talking of the challenges of finding new members, Mr Hutchins said: “A new WI [Women’s Institute] opened in Tunbridge Wells not so long ago and managed to sign up 100 people. “I would like to find out exactly what they are doing to attract members.” The Rotary Club has more than a million members around the world with some 35,000 branches. We support many local community groups and events, and raise money for local and international charities. Regular Meetings are held at The Nevill Golf club Tunbridge Wells. Contact us for more information. Get in touch if you would like more information or would like to attend one of our meetings.